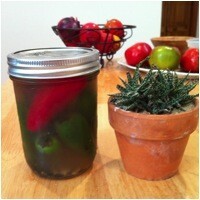 Home » Recipes » Appetizers » Pick a Peck of Pickled Peppers! I worked on a small farm for two seasons. At the beginning of the growing season the managers of the farm asked if I had any special requests. I told them that I really love to cook spicy foods and asked if we could grow jalapeno peppers. Excited by my enthusiasm we planted about 6 jalapeno plants. The heat and weather this summer created the perfect conditions for the hot peppers to thrive. As a result of my innocent request we are inundated with jalapenos. There is really only so much heat one can add to a dish – but I refuse to let these beautiful gems go to waste. So it quickly occurred to me that I have to get pickling! I started by going online and ordering some inexpensive pickling jars. Then I researched some recipes and got to it. I learned it is very important when doing any sort of food preserving to make sure that the jars are completely sterile before beginning the pickling process. The method I used was to wash the jars in suds and then rinse them in very hot water (you might want to use gloves!). Then you just boil the jars and lids for 10 to 15 minutes in a covered pot. Let them sit in the hot water until you are ready to begin. For more about canning safely and thoroughly check out the steps noted on through the University of Minnesota Extension. Stuff each jar with as many jalapenos (whole or sliced) that will fit. Then pour in the hot pickling liquid (see below for recipe), leaving a quarter to a half-inch of space at the top. Then you are ready to cover and store for a cold night in December when the heat of those pickled jalapenos will course through your veins warming you right up! Serve as toppers on nachos, chili, tacos or any other recipe where you want a kick! Here is the brine I used for my most recent batch. It was enough for 3 one-pint jars of jalapenos. Distribute the jalapenos evenly between the jars. Add the rest of the ingredients to a pot and bring to a boil. Turn down heat and let simmer for 5 minutes until the salt and sugar have dissolved and the flavors have combined. Poor the hot pickling liquid over the jalapenos, leaving a quarter to a half-inch of space at the top. Cover and allow to sit for a few hours. Before refrigerating give each jar a shake to make sure everything is evenly distributed. Then store in dry cool area. Comment on Pick a Peck of Pickled Peppers!